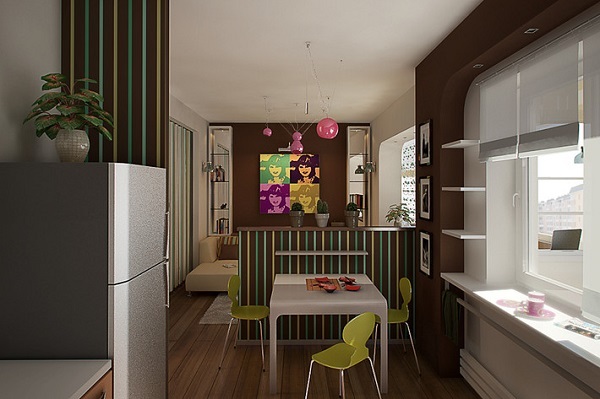 A young girl wished her apartment to be designed in disco-style. The 60’s and 70’s of the last century are known as a period of famous music bands that gathered thousands of young people to enjoy music and dancing. This period has been taken as a basis for the interior of her small apartment. 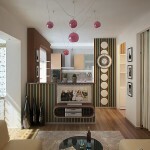 The designers had to deal with quite a small space – just one living room, kitchen and bathroom. They divided the room into smaller functional areas interacting with each other but still designed for only one important purpose. So, a small bedroom took place in the living room, separated from the general area by curtains. It is absolutely private as a good bedroom should be. At the same time, the hostess can move away the curtains and watch TV while lying in bed. 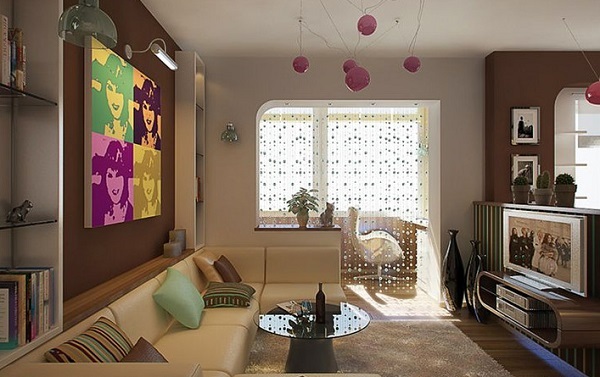 A comfortable living room with minimum of furnishings serves for sitting with guests and as a place for leisure. 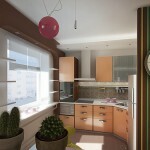 A home cabinet has been designed at the balcony, a wall separatesg it from the living room. So, we can see that designers used all available space with maximum of benefit and even managed to create areas for special purposes. 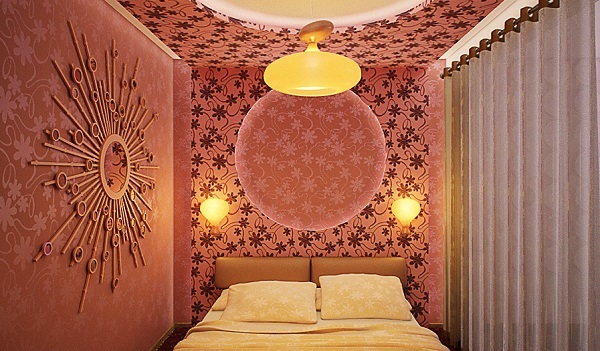 The whole apartment is decorated in bright colors of disco clubs and night parties. Every accessory, every single detail remains of the 1960-70’s; the time when clubbing has been even more popular than now. The time when clubbing has been a lifestyle, rather than a kind of entertainment. 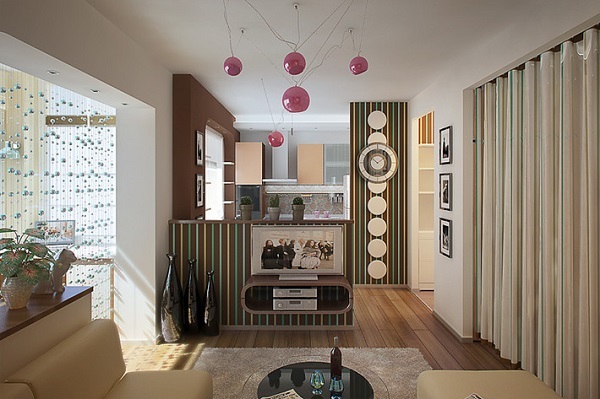 Nevertheless, color scheme doesn’t lack certain style and harmony. Everything about the interior design tells about its hostess, reflecting her character and habits. Low sofas and armchairs remind of those, placed inside the night clubs. A lot of glittering details, like small glassy curtains, shiny golden patterns of the wallpaper and colorful stripes bring the atmosphere of cozy but glamorous lifestyle. Like this blog very much! 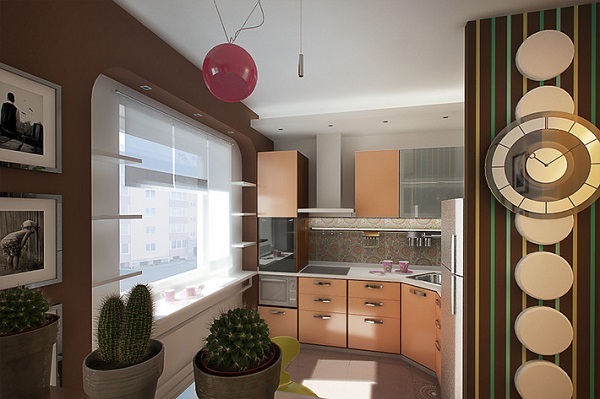 love the interior designing and furnishing, the colors used are so lovable!